As per the name the meaning of the transistor is a device which simply transfers resistance. When there is a transfer of resistance it is obvious that there will be a transfer of the flow of the current also from one part to another part of the device. It is the advanced version of the triode. Before the transistor we have a device called a triode who has three terminals. The problem with the triode is its larger size as well as the wastage of energy in the form of the heat. To solve this problem is this transistor is designed. There are broadly two types of transistors called PNP transistor as well as NPN transistor. Every transistor will have three parts called emitter, base and collector. The purpose of the emitter is to emit the flow of the current and hence it shall be having lots of free charges available for the purpose of passing and initiating the current through it. To make it possible it is highly dooped. Doping is a phenomenon of adding impurities and here we are going to add impurities a little bit more therefore it can have better availability of the free charges through it. The base is a part of a transistor who has the job of just passing the current from emitter to the third part of the transistor. It has to just neutralize the depletion regions and hence it is just very lightly doped. Collector is the third part of the transistor who has to collect the current that is coming from emitter through the base and further positive the circuit. Though we are having three parts of the transistor, current any circuit cannot be driven by itself because of the internal opposition that the electron flow has and hence it demands batteries. To initiate the flow of the current through a transistor at the input level we need one battery and at the output level also to pass the current further in the circuit in a continuous manner we need one more battery. Thus the input battery demands two terminals to connect with its positive and negative plates as well as output battery also demands two more terminals. The problem with the transistor is it is having only three terminals therefore we have to make one terminal common for both input and output. Depending on which terminal we are going to take as common, transistors can be possibly connected in three different ways. They are common base configuration, common emitter configuration and common collector configuration. In any of these processes the current that is emitted from the emitter is taken over a little bit by the base and the entire remaining current is passed over to the collector. To show the transistors in the symbolical way three lines are drawn where the emitter is going to have an arrow mark . In the case of a PNP transistor and NPN transistor,the emitter shall show the direction of the flow of the current through its arrow. We know conventionally that the flow of the current is always shown from the positive to the negative and hence the arrow mark is also shown from P type to N type. It is explained earlier the transistor demands the voltage inputs that both input level as well as the output level. 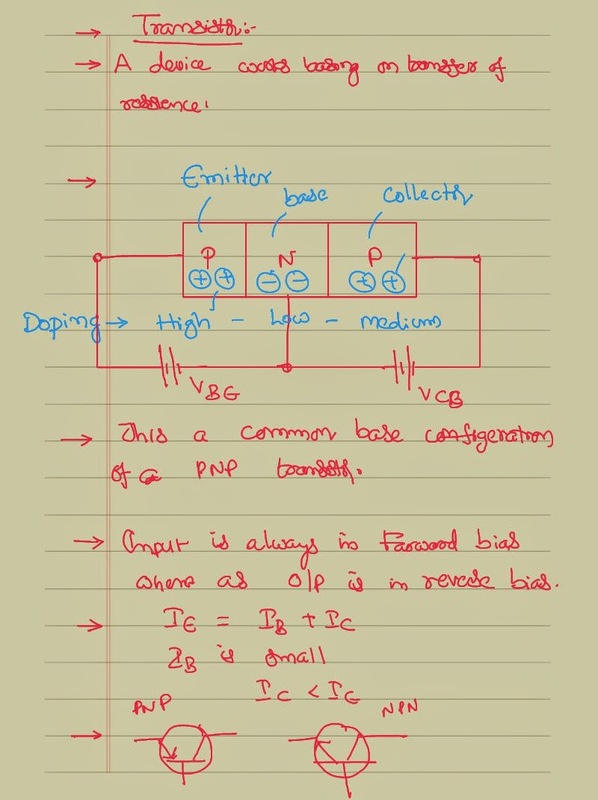 The voltage that is connected the input shall be always in the forward bias.Then only current can through the emitter from the emitter towards the base and then to collector. Similarly the voltage that is connected the output level shall be always on the reverse bias therefore the collector current will be further enabled to flow in the circuit and it can reach back the emitter. Whatever may be the kind of the transistor and whatever may be the kind of the connection that you are going to make these two conditions shall be always satisfied transistor to work in a effective manner. Depending on the type of the connection that we are going to choose and depending on choosing the terminal which is common for both input and output transistor can be connected in three possible ways. In each of the type of the connection who is the input and who is the output and what happens to the current and output level is as described below. 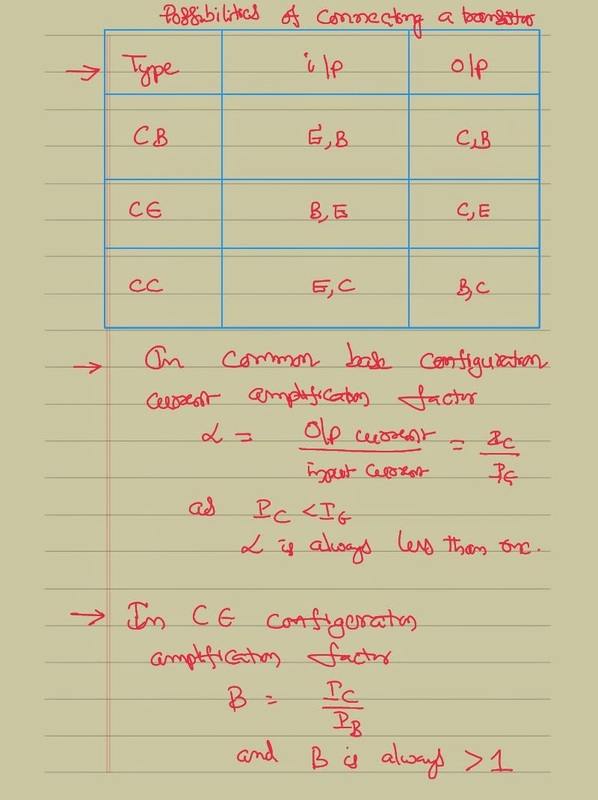 When you connect the transistor in a common base configuration being the base is common for both input and output the current amplification factor is the ratio of the current that is generated through the collector to that of the current that is emitted at the emitter. As the collector current is always a little bit less than that of the base current,amplification factor is always less than one. That means in this kind of the configuration and the connection the transistor is not actually going to act like an amplifier. When you connect the transistor in a common emitter configuration ,the current amplification factor is equal to the ratio of the change in the collector current to that of the base current. As the collector current is much more than that of the base current, this application factor is always much greater than that of one. Thus a transistor connected in a common emitter configuration always gives you a better current amplification and this kind of connection is always preferred in so many electric circuit is to get the amplification phenomena when the transistor is being used as a device.